Around July 15, a giant piece of ice broke off from a glacier called Petermann in northwestern Greenland. Any such floating piece of ice that’s broken from a glacier is called an iceberg. Scientists are tracking this iceberg, which is like an island about one sixth the size of Singapore. Just two years ago, a chunk of ice twice the size of this iceberg broke off from the same glacier. Another event was observed in Greenland this month. About 80% of Greenland is covered with ice, and the ice in places is as thick as 3km (2 miles)! 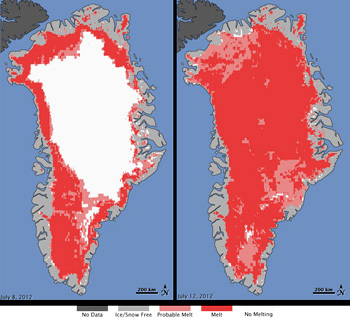 During the summer months, the top surface of about half the ice that covers Greenland sees some melting. However, this July, scientists observed that the surface of most of the ice that covers Greenland saw some level of melting. When large chunks of ice break off glaciers, they appear blue in color and not white. Wonder why? Ice is usually white because it has little bubbles inside which help reflect light. But ice in glaciers is very compact, and has no bubbles. Only blue light manages to go through the ice while the rest gets absorbed. Greenland is the largest island in the world (not including continents). People have lived in Greenland for about 4500 years. The majority of Greenlanders today are Inuit, the indigenous people of the Arctic region. Greenlandic, a language spoken by the Inuit people, is the official language.The capital of Greenland is Nuuk. Greenland is not a country – it has been a part of Denmark for about 300 years. Here is an interactive page that shows the icebergs forming from the Petermann glacier in 2010 and in 2012. 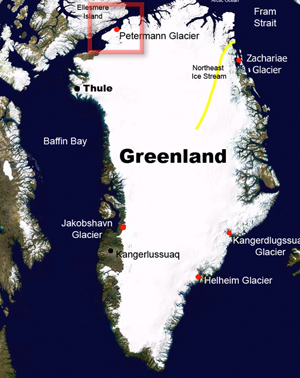 There is a town called Qaanaaq in Greenland, Denmark, which is about 150 miles from Canada. One thing special about the town is that its name is a palindrome.